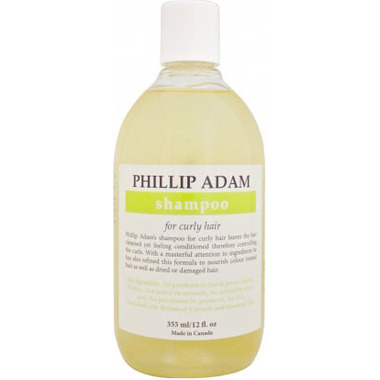 Phillip Adam’s Curly Hair Shampoo controls the frizz in curly hair by using an extra amount of Pea Protein and Gaur! Scented with essential oil of Peppermint, Eucalyptus and Tea Tree oil, this shampoo not only benefits treated, dry or damaged hair, but also smells great! Ingredients: Purified Water (Aqua), Decyl Glucoside, Ammonium CocolyIsethionate, Cocamidopropyl Betaine, Hydrolyzed Pea Protein, Lactic Acid, Guar Hydropropyltrimonium Chloride, Glycerin, Caprylhydroxamic Acid & Caprylyl Glycol & Glycerin, Mentha peperita (Peppermint) & Eucalyptus & Tea Tree Essential Oils, Chamomilla recutita (Matriarca) Flower Extract, Melissa officinalis Leaf Extract (Lemon Balm), Urtica dioica (Nettle) Extract, Rosmarinus officinalis (Rosemary) Leaf Extract, Salvia officinalis (Sage). This product was manufactures Cruelty Free! Love it. Bought a year ago. It lasts long. It gets hair and scalp squeaky clean. Would recommend. Good product in general that does not strip the hair too harshly. Did not notice anything about my thick curly hair. This shampoo did not clean my hair well and I didn't notice an improvement in my curls. I stopped using it and tried it again a few times over but my curls kept going limp. i have fine, wavy-curly hair. Smells great, lathers really well, and I love that's it's safe but not sure it did anything to enhance my curls. I would buy it again unless I find something better for curly/wavy hair. Wow. Is this ever nice stuff! I have very curly hair that is prone to frizz and tends to be very dry. This shampoo leaves my hair soft, cuts down on the frizz and best of all it puts badly need moisture back into my curls. I am in shampoo love. Where has this been all my life. So glad that I decided to try it. Will definitely be buying this again. WOW, does this and the conditioner ever bring out the curl. Super nice smell, lathers well. I wish Well sold the BIG bottles. I really love this shampoo. I have lots of fine hair, and this formula doesn't weigh down my curls. There's not much of a soapy lather, so it doesn't dry out your strands. Smells nice too!